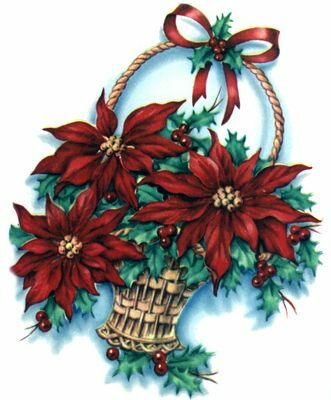 Transform a smaller poinsettia plant into a dramatic basket of color and texture with this budget-friendly holiday decorating idea. In only minutes you can have a fabulous poinsettia arrangement that will brighten your home for weeks. 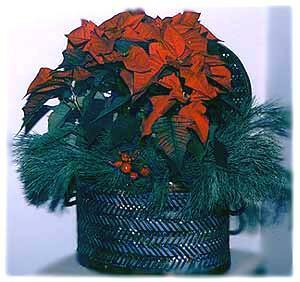 Place a pointsettia plant in the centre of your basket (first, insert a dish to protect the container from water). Stuff newspaper between the plant and the basket, to keep the pot secure in its place. Insert sprigs of fresh pine (you can also use artificial garland), pushing the greenery either into the soil of the plant or into a surrounding container of water. You can also insert fresh greenery without a water feed, but it won’t last as long. Artificial berries usually come in bunches and for this project, I did not separate the bunches, but inserted them whole, between the pine branches. It is a amazing what a difference the addition of a few bright clusters of berries make to this display. If you don’t have a basket handy, press another container into service – an unused soup urn or large casserole dish, for instance. Copyright © 1999-2015Susan Spatone All rights reserved.